Starting with something as simple as a boy who wants a dog, His Whole Life takes us into a rich and intimate world where everything that matters is at risk: family, nature, country, home. At the outset, ten-year-old Jim and his Canadian mother and American father are on a car journey from New York City to a lake in eastern Ontario during the last hot days of August. What follows is an enveloping story that spans a few pivotal years of his youth and sets out competing claims on everyone’s love: for Canada over New York; for a mother over a father; a friend over a husband; one son over another. 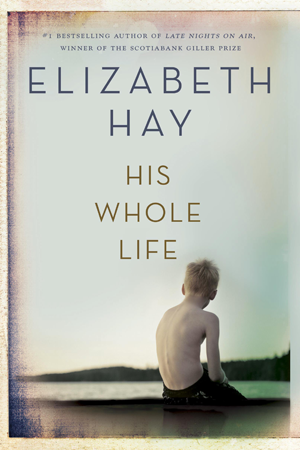 With her trademark honesty, vivid sense of place, and nuanced characters, Hay deftly charts the deepening bond between mother and son as a marriage falters and the family threatens to come apart. Set in the mid-1990s, when Quebec was on the verge of leaving Canada, this is a coming-of-age story as only Elizabeth Hay could tell it. With grace and power she probes the mystery of how members of a family can hurt each other so deeply, and remember those hurts in such detail, yet find openings that shock them with love and forgiveness.